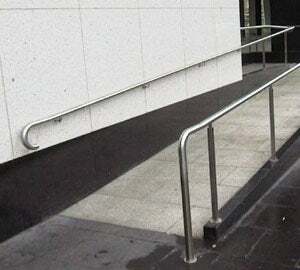 Ramp handrails and kerbs or kerb rails. 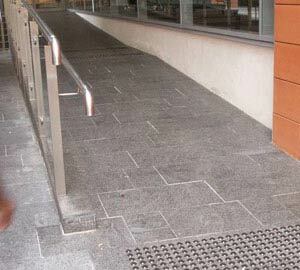 Handrails and kerbs or kerb rails on ramps are important to people with a range of disabilities, for example, people who are blind or vision impaired, people with a mobility disability and people who have an intellectual disability or brain injury. Two handrails are required as some people may not have the use of both hands in which case they may need to use either the left or right handrail. 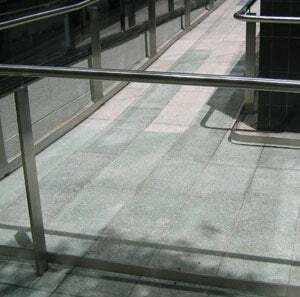 Kerb rails are required to reduce the chances of people who use wheelchairs running off the edge of the ramp or catching their toe plate behind the handrail supports and as a result tipping out of their chair. 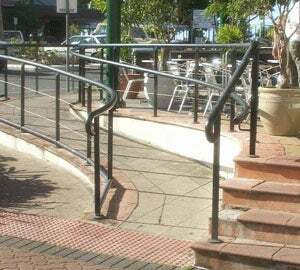 The specifications relating to the ergonomic design of handrails ensure they can be used by all people, especially those with a disability that affects hand or arm function. 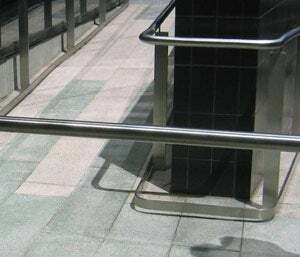 Continuous handrails that allow a user’s hand to maintain a continuous hold on the handrail assist in safe movement throughout the complete journey either up or down a ramp. 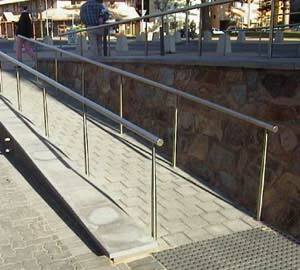 The ends of handrails must be designed and constructed to reduce the incidence of injury to pedestrians. 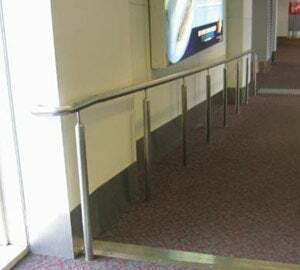 The Building Code of Australia (BCA) specifies handrails in D2.10(b)(i) and D3.3(c) where it refers to and requires compliance with AS1428.1. AS 1428.1 specifies technical details such as clearances, location, dimensioning and safety design criteria. 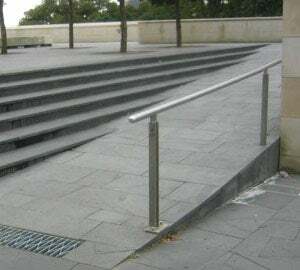 To be effective handrails must be within the design criteria set out in AS1428.1. A min of 1m clearance between rails, with appropriately increased turning space at a change in direction. Clearances of the top arc of 270° throughout their full length. The ends are terminated by returning to a side wall or downwards on to a post or by returning back 180° on themselves. Ends of handrails at the bottom and top of ramp must horizontally extend for at least 300mm from the transition in change of plane. 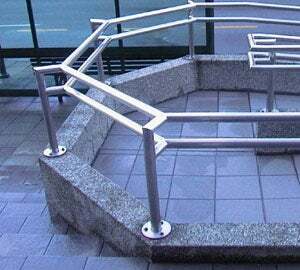 Handrails on both sides of the ramp are 30 – 50mm diameter. Raised dome buttons are only required on the ends of handrails where TGSIs are exempt from being used, for example, in Aged Residential Care facilities. To be effective kerb rails must be within the design criteria set out in AS1428.1. Correct placement and dimensioning of the kerb rails. Location of the kerb rails in relation to the handrails. The handrails in photos 2 and 3 do not meet the specifications of AS 1428.1 as they do not return to a side wall or downwards and back on themselves 180°. Photo 3 shows the handrail end at a height where a small child could accidentally run into it and injure their head. The handrails in photos 2, 3 and 4 do not meet AS 1428.1 because the handrails do not extend out horizontally for a minimum of 300mm past the transition point in the change of plane. Photos 4 and 5 do not have the required clearance for the full length of the hand rails as the fixings intrude into the required clear top 270° arc and 15mm minimum clearance under the handrail (see diagram in Issue 2). Photos 6 and 7 show the correct application of returning the handrail down and back onto itself to form the 180° return or onto a post. Note also the required clearances on the top 270° arc of the handrail and the 15mm directly under the handrail to allow for an uninterrupted transition along the full length of the handrail for fingers and thumbs. The ramps in photos 8 and 9 do not comply with AS 1428.1 because they have no kerbs or kerb rails. 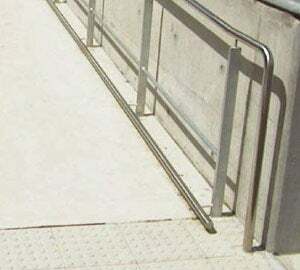 The ramp in photo 10 has the kerb rail incorrectly located as it intrudes into the trafficable surface of the ramp beyond the inside edge of the handrail. 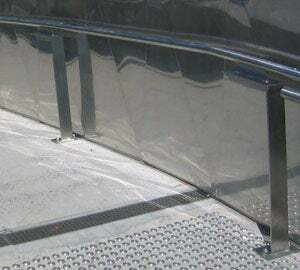 It is required to be parallel with the inside edge of the handrail or set back no further than 100mm. In photo 11 the kerb rails are parallel with the inside edge of the handrail and located as required by AS1428.1.